Country Club Vacation India is a pioneering network of family hospitality services across India. The “Biggest Chain of Family Clubs in India”, Country Club India has world-class clubbing facilities spread across 186 locations in India. The family holiday packages are very innovatively designed as per the members' preferences to give them an experience to remember. Country Club India’s innovative celebration of festivals and events make it known as the "Powerhouse of Entertainment". Its reputation is fast growing due to the vast array of events that are filled with fun activities for people of all ages. Celebrity spotting at these events is very usual. Country Club Vacation, the largest network of family clubs, hosts an assorted array of entertaining events that can be enjoyed by people of all ages! These events are organised frequently from time to time and are often attended by celebrities. The club usually celebrates various festivals, nationally as well as internationally. One more speciality of Country Club India is that its restaurants serve the delicious food with no compromise in quality. When they combine food and events, it’s the best combination you can get! 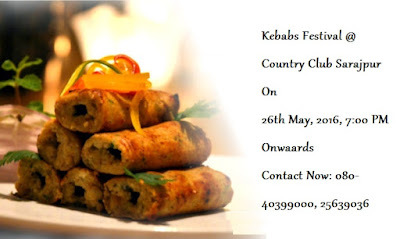 Country Club Sarajpur is organising one such event – The Kebab Food Festival. Just the words make the mouth water and rest assured you won’t be disappointed. So book your tickets now! Food & Beverages are chargeable. Limited seats only.